I had the honor of interacting with an amazing group of educators and artists in Liora Bresler‘s The Arts in Elementary and Early Childhood Education course at the University of Illinois. Throughout the evening our group explored the five aesthetic operations [repetition, formalization, dynamic variation, exaggeration, and surprise!] identified by EllenDissanayake_HandbookEducResArtsRev. We uncovered their individual and collective power by manipulating loose parts, searched for evidence in beautifully designed spaces, and wondered about the potential to design and assess engaging learning environment for all learners from my latest publication with Emily Verba Designing and Assessing Aesthetic Learning Environments . Enjoy a slide show of our loose part design and feel free to comment on their creativity, individuality, and felt sense. These loose parts designs, reminiscent of Reggio inspired nature designs, document the creativity, individuality and felt sense of mutuality. “Taking the arts seriously means arts for everybody, not simply as enrichment or appreciation but — in schools and communities — as encouragement and opportunity to participate from the first years of life and throughout life, as was the human birthright.” (Dissayanake, 2000, 185) The arts infused into our everyday work, in the simple manipulation of objects in a space or arrangement of space to create a sense of place, imbues the viewer and visitor with a sense of mutuality, belonging, competence, meaning and artifying. This entry was posted in Uncategorized and tagged Aesthetics on April 14, 2013 by Pat Pinciotti. What inspires you? Where do you feel happiest? How do you get creative? A visit to a museum always surprises me. Not just the art that is given to me a visual gifts and physical rest, but the thoughts I have while strolling, looking, interacting, feeling, while I am there. I am always surprised by the creative ideas that seem to spontaneously pop into my mind. If I had worked hard at thinking about a new course, redesign of an assignment, ways to engage my students, or rearrange my living space it would have been just that … hard work! But my meandering through another’s creative meaning making let’s my mind do just that… MEANDER. And it is in the meandering that new connections, inspirations, colors, images, and feeling/thoughts are revealed. The experience of another’s creative work refreshes my mind and provides a physical rest from my everyday living. SO….go to a museum, see a play, a movie, look at art you have never seen before, go to a concert, see dance, listen to music — BE INSPIRED! Be energized for the new year. See the movie Lincoln and visit the Civil War exhibit at the Smithsonian American Art Museum or stroll through Ai Weiwei installation at the Hirshorn, According to What? and then send him a message through the Hirshorn website. If you cannot go in person meander in the virtual world of museums and artist’s websites. These are some of the best websites you will find. Or visit the images, people, and spaces by following my pinterest. The San Francisco Museum of Modern Art is a great place to begin your virtual search. The image above is from SFMOMA’s Pinterest site. Looking for museums from around the world go to GoogleArtProject. Let the inspiration begin. Let me know what you find. DO SOMETHING CREATIVE EVERYDAY in 2013! This entry was posted in Uncategorized on January 1, 2013 by Pat Pinciotti. This entry was posted in Uncategorized on December 12, 2012 by Pat Pinciotti. 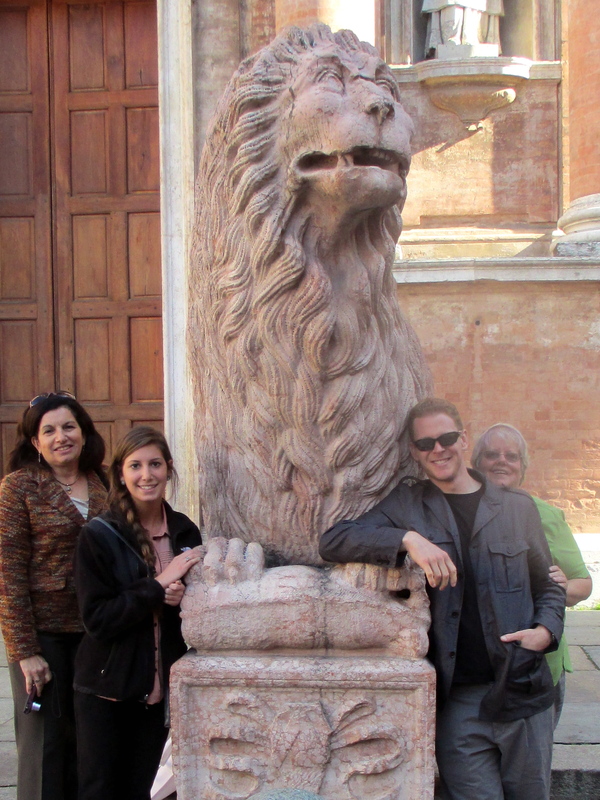 This entry was posted in Uncategorized and tagged Reggio on October 28, 2012 by Pat Pinciotti. Thursday we begin to delve more deeply into literacy and the Reggio elementary schools. The primary teachers prepared some rich documentation for the representation showcasing their literacy work with the children. Inherent in their image of the child is a strong belief in their capacity to be learn era, to be curious and creative. Have we forgotten this in our schools? Their documentation highlighted children’s ability to grapple with codes and why we need to have agreement so we can read each others writing and communicate to a wider audience. Over wonderful food we have been planning how to document our experience and share it with the ESU community. We are also dreaming…the primary school was the most amazing learning environment I have ever seen! More to come on this. Tomorrow we begin at the market where the lions sit. This entry was posted in Uncategorized on October 26, 2012 by Pat Pinciotti. Today we were able to see the teachers and children in a typical day. We observed at the Diana school, situated in the park just off the piazza Della Vittoria. 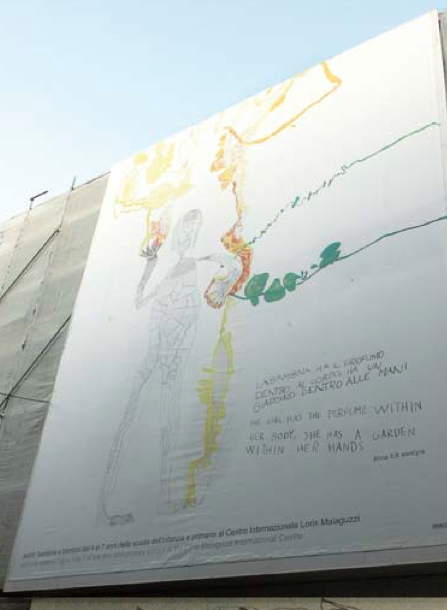 A hallmark of Reggio is transparency highlighting the relationship between the school and the community, the indoors and outdoors, the child and others. We observed in three classes, 3, 4, and 5 years and in the “piazza” and the atilier or art studio. The children where engaged in drawing, constructing, painting, and dramatic play as they investigated shapes, color, balance, technology, shadows, and story. In one art studio they were investigating smells and creating scents by combining various flowers, spices, and herbs. These ere placed on leaves or small tree stumps to mix together in small smell collages. The children then recorded, using symbols or drawings, the recipe for the new perfume. This entry was posted in Uncategorized and tagged Reggio on October 25, 2012 by Pat Pinciotti. Finally we are in Reggio and we have Internet! We have kept notes, photos and reflections throughout our time traveling, but have not been able to post yet. A dinner at Cavazzone with all 68 of the study tour participants allowed us some social time to meet people from South Carolina, Indiana, Ohio, India, Shanghi, and even PA. We begin our first session tomorrow at 9 so get ready for some exciting discoveries in our learning. Having a hard time inputting pictures with my ipad…. feel free to comment, question, wonder. 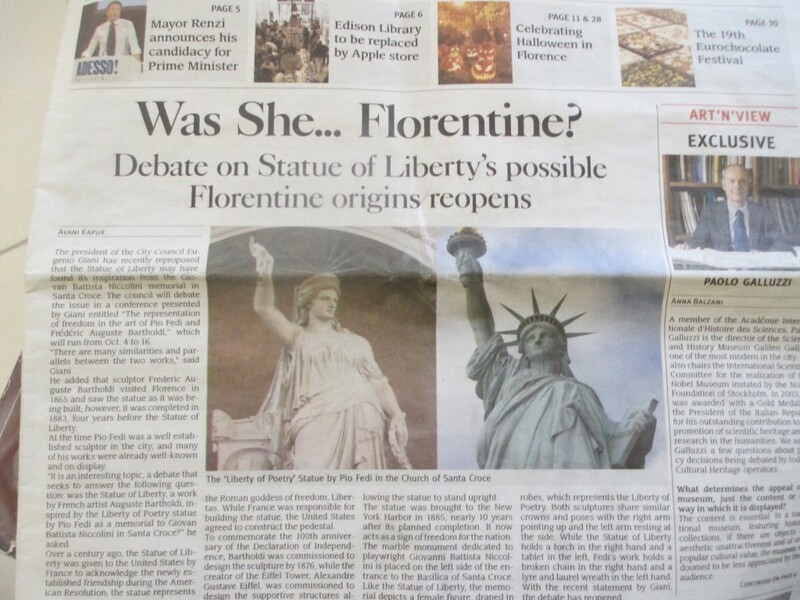 Here is an interesting investigations we found in Florence…enjoy! This entry was posted in Uncategorized on October 22, 2012 by Pat Pinciotti. What are you creating this summer? Happy Summer….I have been busy revising the Aesthetic Assessment Tool for the classroom and getting some wonderful feedback from my “peeps”. Also, I finally started workin’ my Pinterest Boards for my fall classes. If you are on Pinterest already, check them out, if not, ask for an invite. 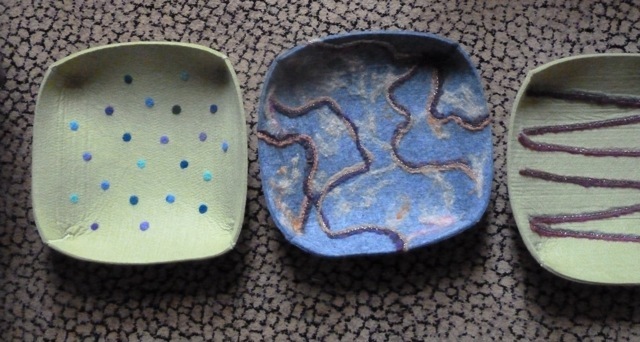 And to keep my hands rally busy, I felted some designs on felt bowls. What FUN!! Karen Kline, an amazing teacher who uses Art as a Way of Learning® as her everyday work of art with children, sent me this special quote by Kurt Vonnegut. 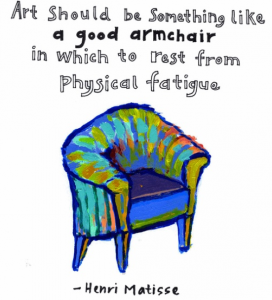 Now, go make art…. This entry was posted in Uncategorized on June 22, 2012 by Pat Pinciotti. Taking a little turn from writing about art and creativity to look at Preschool Education with my Pre K-4 students. Follow the links and prompts and respond to this blog answering any of the questions in bold. Be sure to put your first name/last initial in the post and submit. Stop back and read the comments by your peers and feel free to enter the conversation by responding to any of their blog posts. You can also respond to either Jonah or Maggie’s blog too if you wish. Looking forward to reading your thoughts. Be part of a conversation…. Happy break! After reading the blog post by Jonah, explore the work done by Maggie Doyne in Sukret, Nepal at Kopila Valley Children’s Home and School http://blinknow.org/ Be inspired! What is your “felt sense” about the education of young children after reading the article? Are the ideas presented here consistent with what you are reading in our text by Sue Bredekamp? How does the work at Kopila Valley connect to your reading? How can you make a difference in the lives of young children? This entry was posted in Uncategorized and tagged Education, Pre K 4, Preschool on March 9, 2012 by Pat Pinciotti. Intrigued? Curious? Revisit to learn about an exciting Arts Integration Week at Governor Wolf Elementary School in Bethlehem, PA where 4 fifth grade teachers, 7 ESU Students, and a cast of supporting specialists, Art, AI, Special Education, Music, Library, Physical Education engaged their learners in the life and mind of Leonardo daVinci! Much more to come….. This entry was posted in Uncategorized on December 4, 2011 by Pat Pinciotti.